The wreck of the 501–the Amtrak train that crashed near Seattle on Monday–is raising lots of questions about Amtrak operations, but they aren’t always the right ones. Here are some questions that should be asked and some of the Antiplanner’s preliminary answers. Answers from Amtrak (the operator), FRA (the funder), Sound Transit (the track owner), or WSDOT (the train owner) may differ. 1. Congress required passenger railroads to install positive train control (PTC) by the end of 2015. Why did the Federal Railroad Administration (FRA) give money to the Washington Department of Transportation (WSDOT) for a new passenger rail line that would not open until after 2015 when the project didn’t guarantee funding for positive train control? Answer: The Obama administration wanted to distribute high-speed rail funds to as many states as possible in order to build political backing for the program, so it couldn’t be bothered with positive train control. The tracks the train was on are owned by Sound Transit, which says it is installing PTC, but it won’t be finished until spring. Public releases of WSDOT’s application for funds for this train didn’t mention PTC. 2. Around 800 people die in railroad accidents a year. PTC would prevent only about 1 percent of these fatalities; far more would be saved by spending the same amount of money on better grade crossings and fencing of rail rights of way. Why do we put so much emphasis on an expensive technology that will do so little? Answer: Accidents that PTC could have prevented tend to be more spectacular than people getting killed when a train hits their car at a grade crossing. This suggests that, when politicians decide where private businesses spend their money, it’ll get spent on grandiose programs rather than things that could really make a difference. 3. When an auto driver runs a red light and kills a pedestrian, we don’t blame the auto maker for not making driverless cars sooner; we blame the driver and, perhaps, the people who were supposed to train the driver. 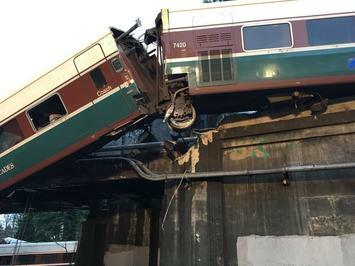 Why blame this accident on the lack of positive train control when the train driver should have slowed down and Amtrak should have made sure the driver was qualified to operate this section of track? Answer: Everyone is looking for a scapegoat, and it is easier to blame an institution than an individual. 4. The train in question had about 250 seats, and this was the inaugural run on this route, which usually generates a lot of interest among rail enthusiasts. Yet there were only 80 passengers on board. Does this confirm that Lakewood Mayor Don Anderson was right when he said “this project was never needed”? Answer: The big change in Seattle-Portland service was not an increase in speeds but an increase in frequencies (a change that may be delayed by the wreck of one of the new train sets funded by the federal government). Amtrak has only been able to fill 54 percent of this train’s seats, and WSDOT was hoping that more frequent and more reliable trains would increase the percentage of seats filled. We’ll know more after a year or so, but it doesn’t look good if the inaugural run filled less than a third of the seats. 5. Why do so many reporters call this a high-speed train? The top speed between Portland and Seattle is 79 mph, the same as it has always been and the same as most other Amtrak routes. In technical terms, this was a conventional, low-speed train. 6. Why do we need passenger trains at all? Amtrak fares from Seattle to Portland start at $26 and cover less than half the costs of the train. Bolt Bus has six buses a day that take less time than the train at fares of around $15. Plane fares start at $65, though most are around $100 (which may still be less than the full costs of Amtrak), and there are dozens of flights a day. Short-distance trains were made obsolete by buses in the 1920s. Long-distance trains were made obsolete by planes in the 1950s. When other transportation technologies, such as horseback riding, steamboats, and canals went obsolete, we let them go except for tourists and museums. Why can’t we let go of the passenger train? Answer: America was suffering an inferiority complex in the early 1960s. We were losing the space race; some thought there was a missile gap with Russia; Japanese electronics were beginning to take over American markets. When Japan introduced its bullet trains in 1964, suddenly there was one more area in which our technology appeared to be inferior. Never mind that our jet airplanes were several times faster than Japan’s trains; Congress began funding passenger trains in 1965, and once a federal program gets started, it generates special interest groups dedicated to keeping it going. Question: At least Amtrak is getting closer to covering its operating costs, right? Answer: No, when Amtrak says that, it is lying. Amtrak counts more than $200 million in annual subsidies that it gets from the states as “passenger revenues.” Amtrak also pretends depreciation is zero even though, at more than $800 million per year, it is the second largest line item on its operating budget. Amtrak’s deferred maintenance has led to a backlog of needs in the tens of billions of dollars. When counting only ticket fares and on-board food service revenues against operating costs, including depreciation, Amtrak operations lose more than $1 billion a year and ticket fares cover only a little more than half the costs. Question: At least Amtrak’s Northeast Corridor makes money, right? Answer: Only if you don’t count depreciation, deferred maintenance, or other costs that Amtrak doesn’t try to allocate to individual routes. The Northeast Corridor needs at least $35 billion in rehabilitation work just to bring it up to a state of good repair. Another way Amtrak has made its trains appear to be profitable is by calling much of its maintenance work a capital cost, and Amtrak can’t afford to do all of the “basic infrastructure” maintenance needed in the Northeast Corridor, much less the rehabilitation work, without federal subsidies of close to $500 million dollars per year (see page 15). Question: So is Amtrak’s maintenance backlog only in the Northeast Corridor? Answer: No, Amtrak doesn’t own most of the tracks it uses outside of the Northeast Corridor, but it still has maintenance needs for its stations and rolling stock. When Amtrak took over private passenger service in 1971, the average age of passenger cars that it acquired from the railroads was 22 years, and they were so worn out that nearly all were replaced within a decade. Today, the average age of Amtrak’s passenger cars is more than 30 years, suggesting that it will soon need to spend billions replacing them. Question: So are all trains obsolete? Answer: No, only passenger trains are obsolete. Freight trains are extremely productive, and America has the finest, most advanced rail system in the world. That’s because it is mostly private and operates to produce profits, not to give politicians ribbon-cutting opportunities. Photo: A handout photo made available by the Pierce County Sheriffs Department showing Amtrak train 501 which derailed onto Interstate 5 near Olympia, Washington — Shutterstock/AP HANDOUT/EPA-EFE/REX/Shutterstock—HANDOUT/EPA-EFE/REX/Shutterstock via Time.